The AAS Laboratory Astrophysics Division (LAD) is pleased to announce the awarding of its inaugural Laboratory Astrophysics Prize to Dr. Louis Allamandola of NASA's Ames Research Center in Moffett Field, California. Dr. Allamandola is cited "for his numerous contributions to the study of ices and polycyclic aromatic hydrocarbons in astronomical environments." Dr. Allamandola pioneered techniques to reproduce conditions on comets and planets and in interstellar space, where stars and planets are forming today. 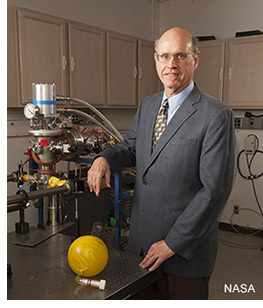 A major focus of his research involves characterizing the infrared signatures of ices and polycyclic aromatic hydrocarbons, or PAHs, complex molecules made of rings of carbon and hydrogen. His studies of ices have revealed the rich chemistry that can take place in the harsh environments of space. His work on PAHs has led to a reevaluation of the physical and chemical processes occurring in space. Dr. Allamandola received his PhD in chemistry from the University of California, Berkeley. His previous honors include Fellowship in the American Physical Society and the American Association for the Advancement of Science. He held the 2013 Oort Professorship at Leiden University in the Netherlands and has received many NASA awards, most recently the NASA Exceptional Scientific Achievement Medal and the honor of being named NASA Ames Fellow. He also received the Presidential Rank Award for Meritorious Public Service in 2006 and 2014. He has trained several graduate students who have gone on to prominent careers in astrophysics. The LAD plans to award the Laboratory Astrophysics Prize annually to an individual who has made significant contributions to laboratory astrophysics over an extended period of time. The prize will include a cash award, a citation, and an invited lecture by the recipient at a meeting of the Laboratory Astrophysics Division.